Planning a trip to Lisbon, Portugal? 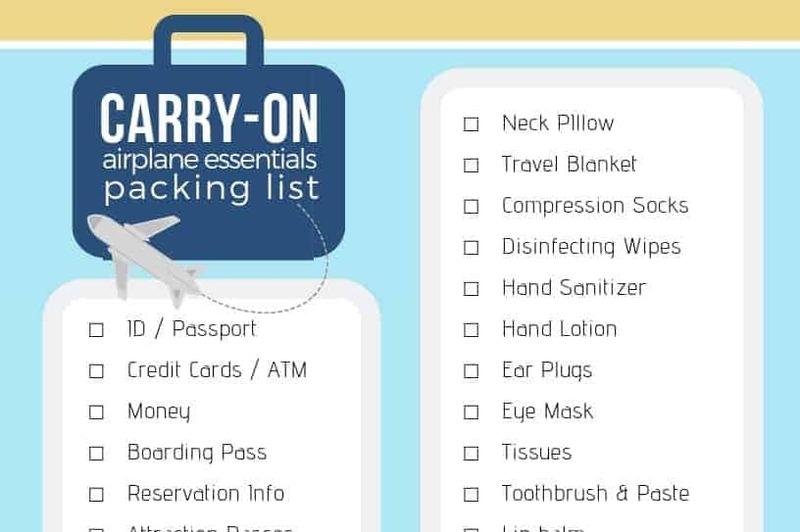 Where to stay in the city depends on what you need. 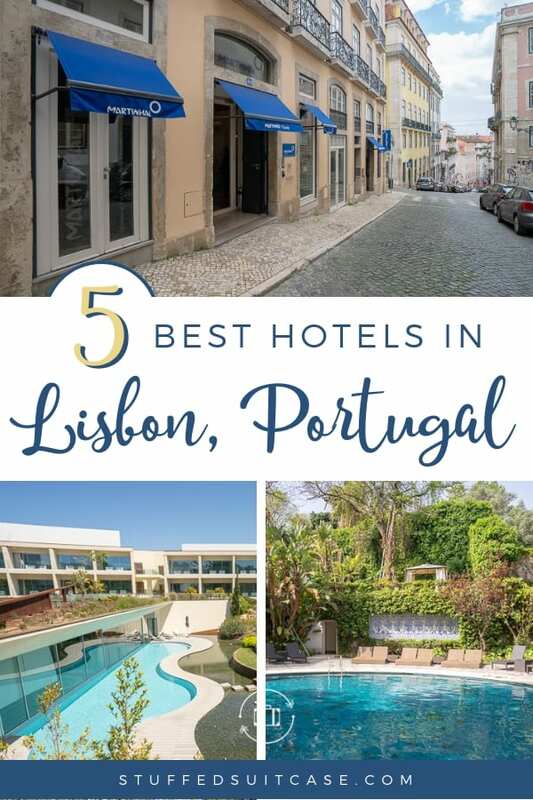 Here are my picks for the top hotels in Lisbon as well as two great hotels near Lisbon in Sintra and Cascais. One of my memorable trips from this year was to Lisbon, Portugal. From the delicious garlic shrimp to the gorgeous tiled architecture, I fell in love with this lesser traveled European city. During my time in Portugal, I had the opportunity to stay at and tour three Lisbon hotels and two other hotels near Lisbon, in Sintra and Cascais. Each of these properties has something very special to offer guests. Whether you’re looking for a family-friendly property or a romantic escape, one of these five hotels in Lisbon could be perfect for your trip. Are you looking for a perfect hotel for families, a luxurious hotel near shopping, or a quaint Airbnb near Alfama? Here are my picks for the top hotels in Lisbon. I was invited to Portugal by Martinhal Resorts and had the opportunity to stay at two of their properties during my trip. 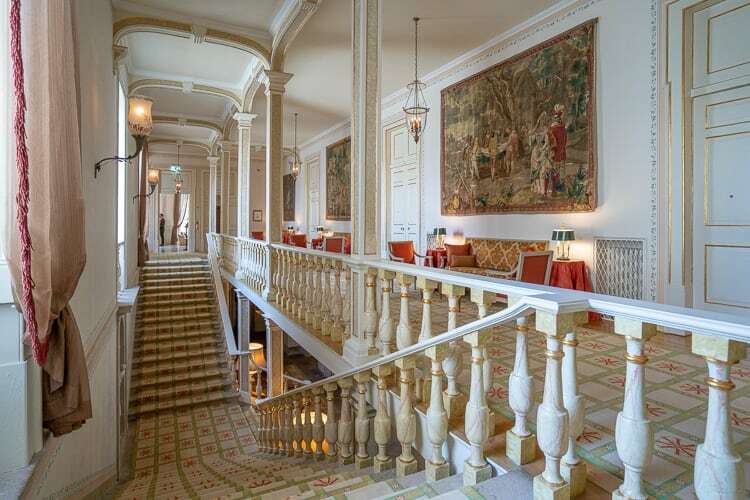 The Martinhal Lisbon Chiado has to be one of the top hotels in Lisbon for families. All of the Martinhal properties are created to welcome families and offer them a relaxing escape. From the amenities to the room design, kids are welcomed without making parents feel like they’re at a McDonalds play zone. 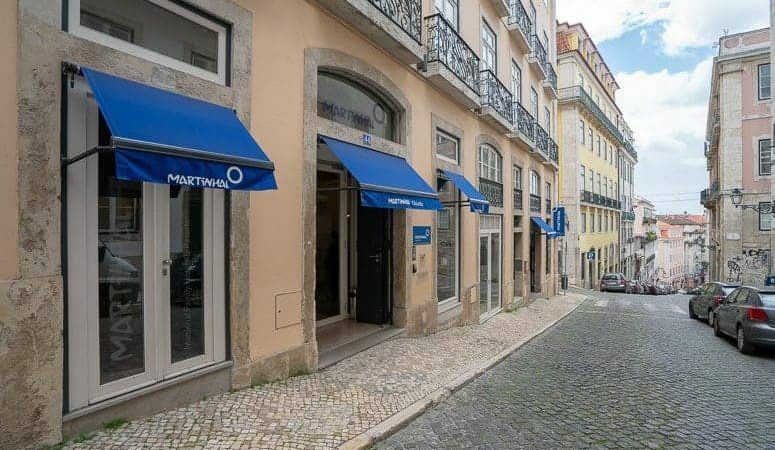 Martinhal Chiado is located in the popular area of Baixa-Chiado in Lisbon. 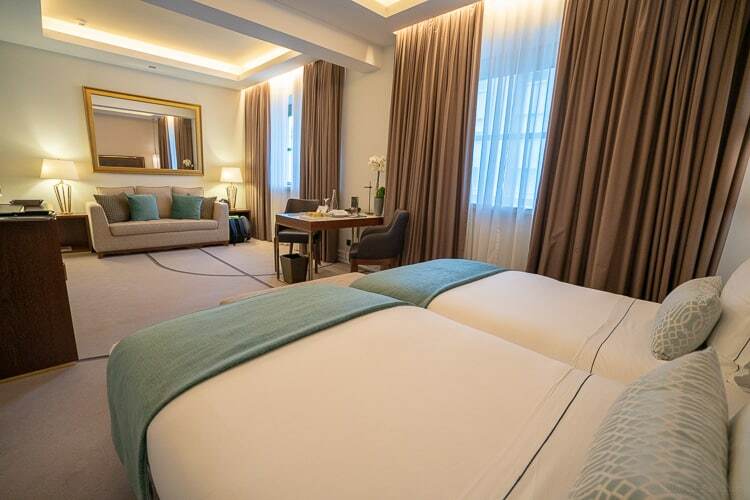 The Martinhal Lisbon Chiado is a unique hotel that offers studio, one-bedroom, and two-bedroom suites for families visiting Lisbon. The building used to be individual condo apartments, and now they’re hotel suites. I stayed in one of their studio suites that featured a double bed and bunk beds, perfect for a family. All of the apartments also feature a full kitchen that is perfect for traveling with kids and making your own meals. Studio suite in Martinhal Chiado is one of the top hotel in Lisbon for families. There is also a gorgeous, small restaurant in the hotel that is great for grabbing breakfast and light meals for lunch or an early dinner. A kids club is also on site for kids ages two to nine and is complimentary. There’s also a baby play creche area for parents to enjoy with their 6 to 23 month-old babies. The other thing I loved about the Martinhal hotel in Lisbon was its location in the Baixa-Chiado neighborhood. 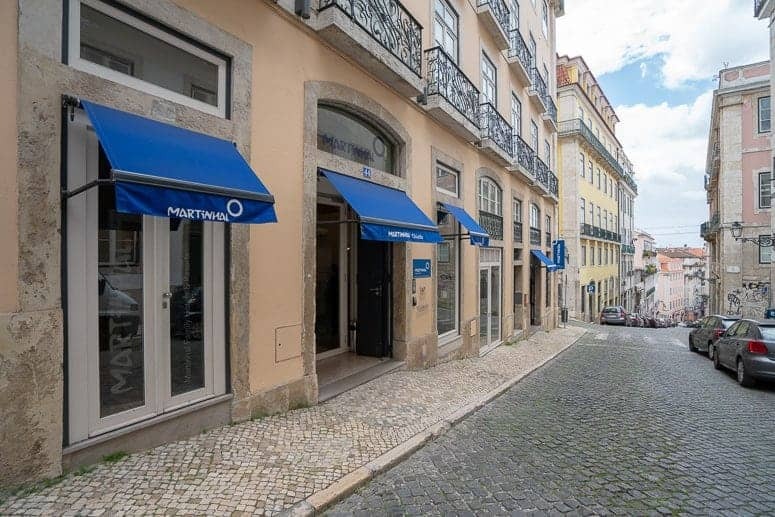 It’s located in a central area between the main train station and the popular restaurant and night scene of Baixa. “We spent 3 nights in Martinhal Chiado when the kids were 5 and 6 and I would recommend this hotel to anyone visiting Lisbon with children. The location is excellent for sightseeing, right in the heart of the city, the suites are spacious and fully equipped for a family stay and we have to give a special praise to the staff as well. 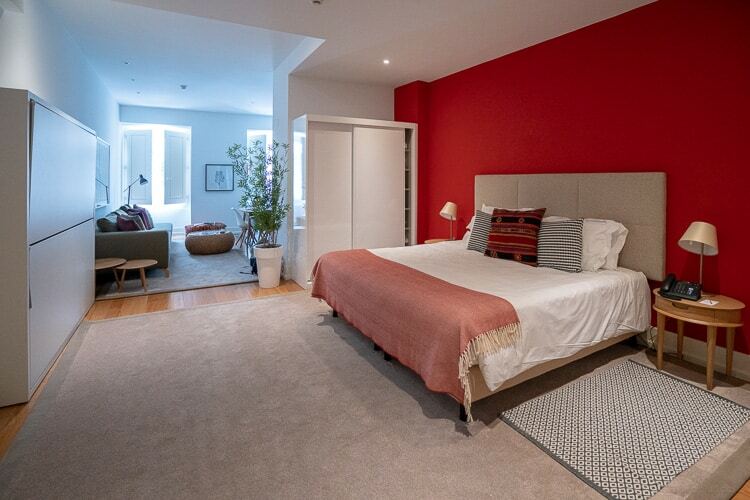 Check out prices at the Martinhal Chiado, it’s rated #2 out of 269 hotels in Lisbon! 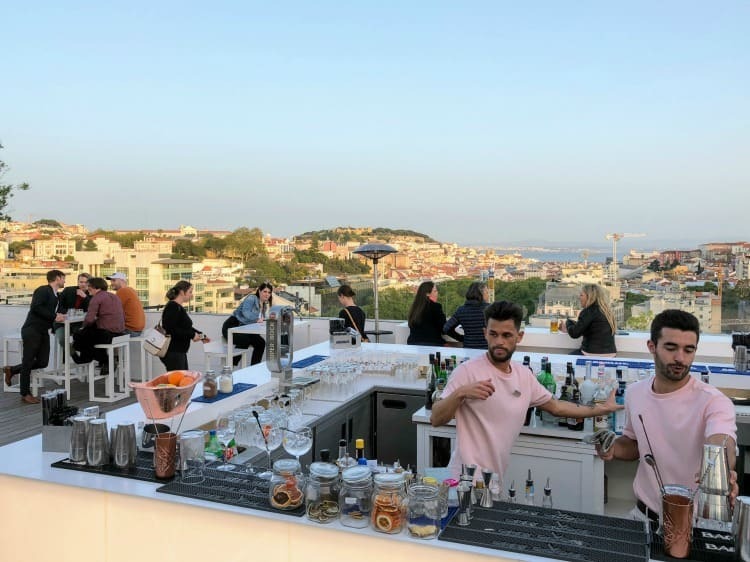 If you’re dreaming of a luxurious city vacation with plans to enjoy a famous Lisbon rooftop bar, the Tivoli hotel in Lisbon is the perfect place for you to stay. 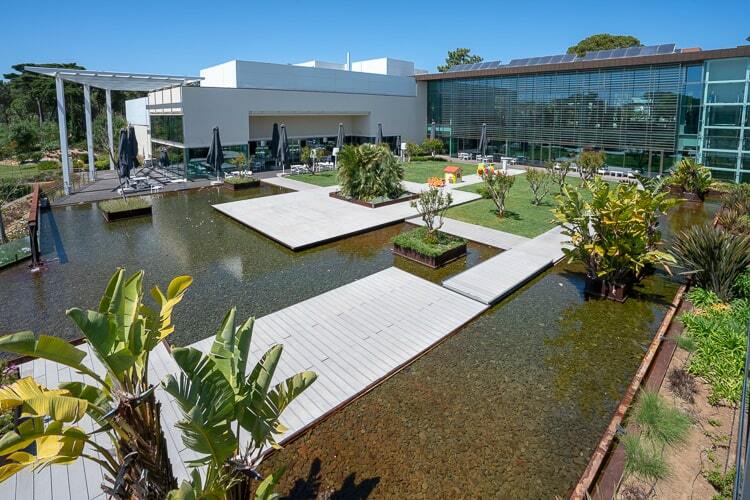 This property is centrally located in Lisbon along one of the main avenues that run into the center of the city. A doorman will welcome you to the hotel as you enter from a tree-lined street that showcases high-end shops like, Prada and Dior. 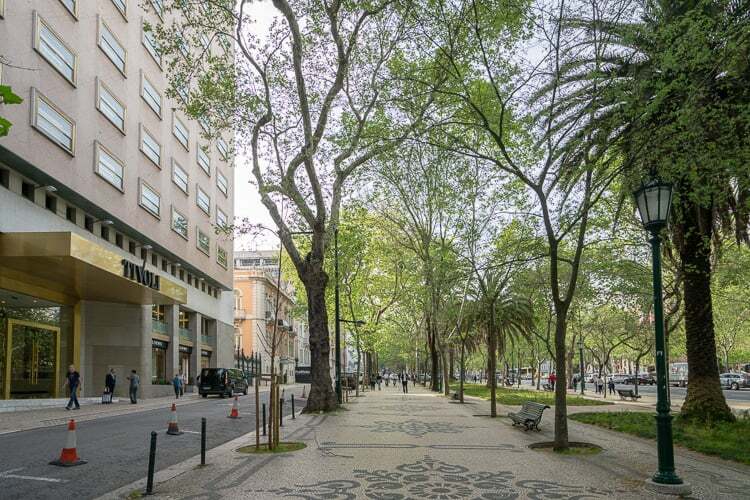 Tivoli Avenida Liberdade is located along a treelined street filled with luxury shops. There are a variety of rooms offered at the Tivoli including rooms with a city view and family rooms that have extra space and a sofabed. I stayed in one of the deluxe family rooms and was absolutely amazed at how spacious the room was. I LOVED my bed at the Tivoli, and they even offer a pillow menu in case you need just the right pillow to rest. 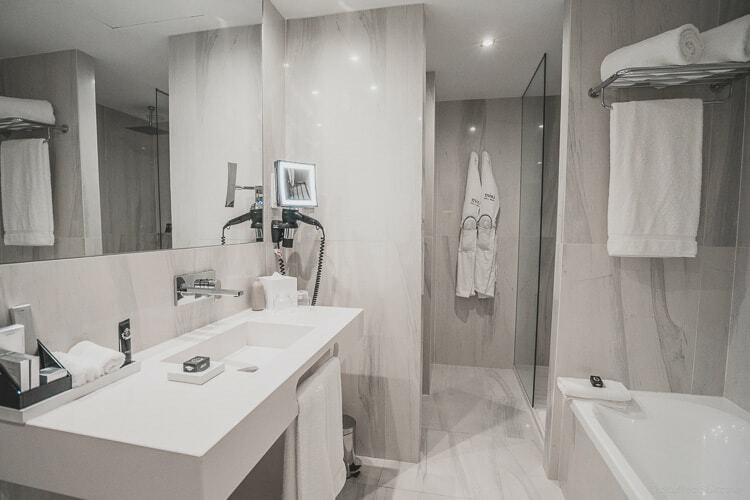 The bathroom was well-appointed and bright with all marble walls. I felt spoiled with the turn-down service each night and looked forward to slipping my feet in my slippers in the morning. Overall everything at the Tivoli was comfortable and I would have been happy spending a whole week there. 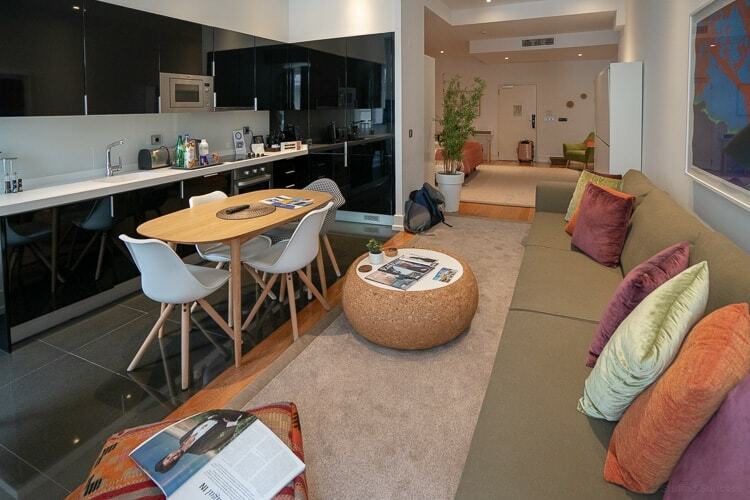 Spacious family room at the Tivoli Avenida Liberdade in Lisbon, Portugal. Wall to wall marble in the bathroom at the Tivoli. Breakfast is included and you’ll find a lot of options including a yogurt bar and omelets. Regular rooms have breakfast in the lobby while suites are allowed to take breakfast upstairs in the Terraco restaurant next to the Sky Bar. Suite guests also have access to an executive lounge that offers snacks and beverages as well as a personal concierge who can help you with planning and reservations. The rooftop Sky Bar will be a big draw for any couple traveling to Lisbon. It’s a large space that features a fabulous view along with music and drinks at night. It is a popular spot, so you have to be quick to grab a table or one of their fun seating areas. Sky Bar is a popular rooftop bar on top of the Tivoli Hotel in Lisbon. The Tivoli Avenida Liberdade also has an amazing on-site seafood restaurant, Cervejaria Liberdade. Tamara and I enjoyed a delicious crab dip and I could have eaten another serving of their garlic shrimp. And if you’re looking to take a dip, they have a lovely garden pool that is nicely secluded. The Tivoli also offers spa treatments at their on-site Anantara Spa. 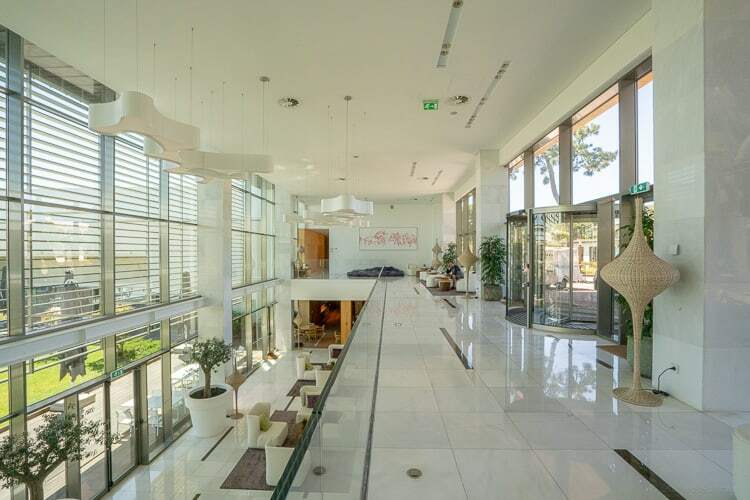 The Avani Avenida Liberdade is a Tivoli partner hotel and has a 4-star rating. If the Tivoli is a bit out of your price point, check out the prices at the Avani. It’s next door to the Tivoli in the same great central location. 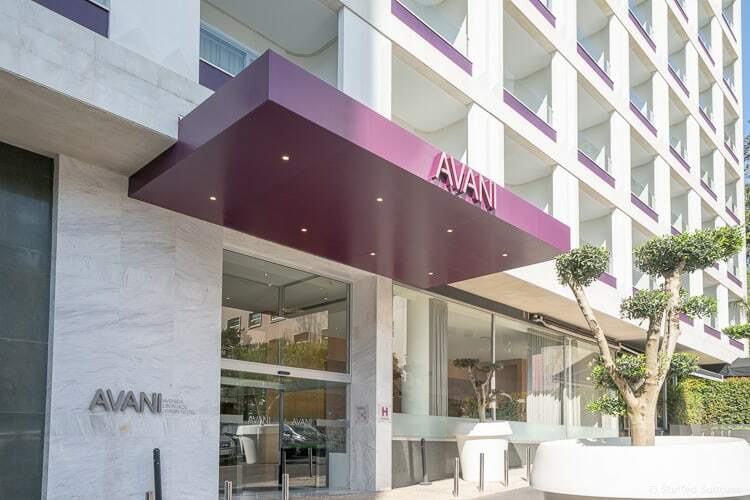 Avani is Lisbon hotel in the heart of the city along the Avenida Liberdade. 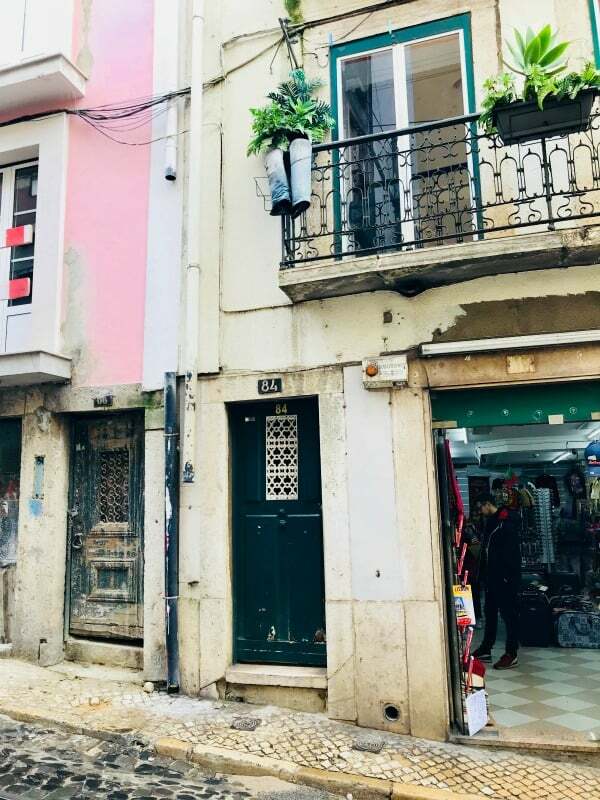 “Our family of 5 stayed one night (we extended our layover to explore Lisbon a bit) at the quirky AirBnB: Casa da Xana located in an old historic building of Alfama. The location was nice – close to Tram 28 and traditional Fado music at the corner restaurant. Also, we were able to walk to Monastery of São Vicente de Fora. You can also find Airbnb in Lisbon, like this cute apartment near the Alfama district. If you’re considering a day trip to Sintra or even a beach escape to Cascais, here are two more great hotels near Lisbon. Cascais is a popular beach getaway about an hour west of Lisbon. 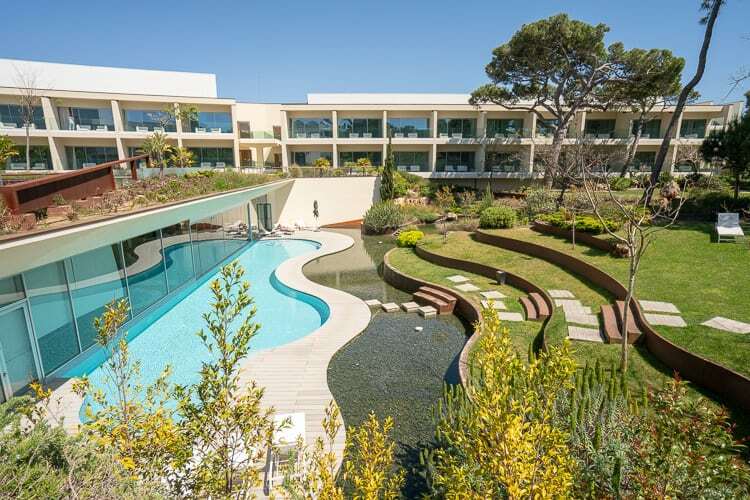 Cascais itself is a bit of a tourist trap town, but if you’re looking for a resort getaway for your family outside of the city, Martinhal Cascais is a gem. The resort is part of the Martinhal brand which I mentioned above as being completely family-focused. They’ve created a charming and comfortable resort that caters to families without losing the luxury feel of a resort. Martinhal Cascais Hotel near Lisbon, Portugal. Martinhal Cascais property room view. 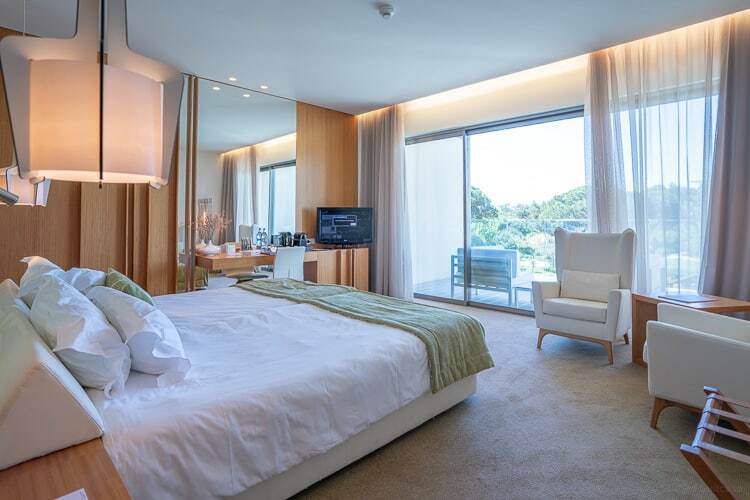 Martinhal Cascais King Bed Room. The resort offers a lot of fabulous room types for families, including rooms that have bunk beds and stand-alone villas. I also loved the robes and slippers they have in the rooms, even kid-sized ones! I also really enjoyed their gorgeous pool and day spa area. They have bike rentals available on property, too. 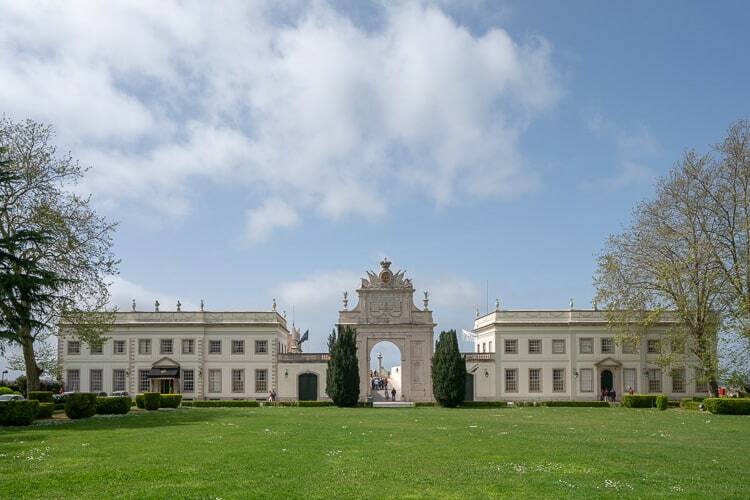 If you’re traveling without your kids and you’re looking for a romantic getaway outside of Lisbon, look at the Tivoli Palacio de Seteais. I had lunch there when I went to Sintra and the property is really something special. It’s an actual 18th century palace and a UNESCO World Heritage Site. Even if it doesn’t work for you to stay at the hotel, definitely stop for a lunch visit. Stairway inside the historic Tivoli Palácio de Seteais. Tivoli Palácio de Seteais Hotel near Lisbon in Sintra. 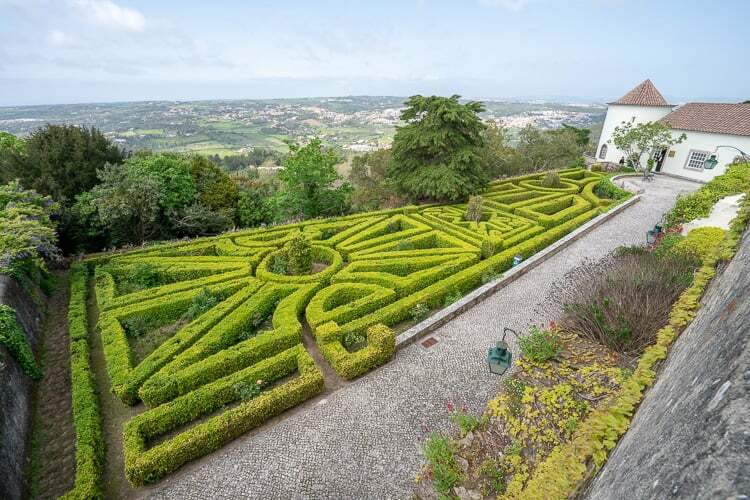 Overlooking the maze and countryside from the Tivoli Palácio de Seteais in Sintra, Portugal. Hotels in and near Lisbon, Portugal.